How many of us have ever thought it would be cool to tattoo ourselves? How many of us would ever have the courage (or a clever idea) to actually pull it off without needing a tattoo concealer later? Check out this signature ink from our friend Brianca. Brianca went to her tattoo artist to get a complicated and design-heavy tattoo on her foot. However, her tattoo artist knew the design would be better placed somewhere else on her body, and figured there could be a better way to achieve the meaningful tattoo she desired. That’s when Brianca’s tattoo artist started to talk Brianca into giving herself the tattoo. Crazy, right? Sounds like a joke but that’s actually what happened, SoCal’s Aaron Carey (http://www.aaroncarey.com/) talked Brianca into giving herself her own tattoo by tattooing her signature on her foot. In the end Brianca is stoked that tattoo has turned out better and more meaningful than she ever could have planned. She says one of the scariest parts was knowing that once you start, you have to go through with it. If you ask me, for a first time tattoo artist that’s a pretty clever way to break the skin and get your first tattoo out of the way with minimal pressure. 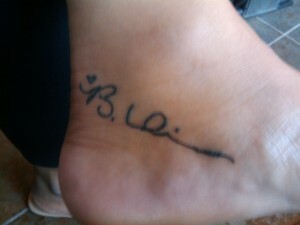 For those of you who are curious, Brianca’s had a couple of tattoos before, but previously none on her foot. Aaron Carey you’re a clever guy.